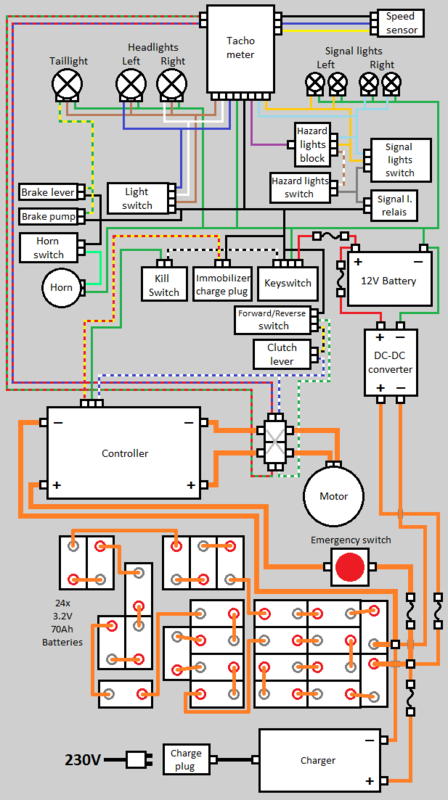 Finished the whole wiring diagram now. Only still have to add the BMS but I can't yet till I actually have it here. No idea how it'll get wired up just yet. The only thing I'm not sure about is the clutch lever. I want to use this in combination with the forward/reverse switch to be able to drive in reverse. According to the regulations of the RDW (Dutch road safety institute) you need 2 seperate actions for this (or only able to activate below 5 kmh but this will be too complicated I think) so I think this will be the easiest solution. Just don't know if it's possible this way or if I'd be shorting out the controller when the switch is in reverse and the clutch lever isn't pulled. So I'll have to ask around a bit before I actually connect it like this.